Backstory: This creative young family wakes up each morning in their Marin County home to the sounds of children and views of Mount Tamalpais. When they purchased the house, it didn’t have the open, airy ambiance they felt it could. But that didn’t mean it couldn’t someday. 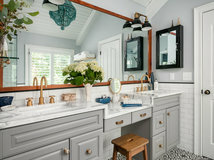 After constantly rearranging to make it feel like home, they decided to give the home, especially the master bathroom, a makeover with the help of designer Kristen Peña. 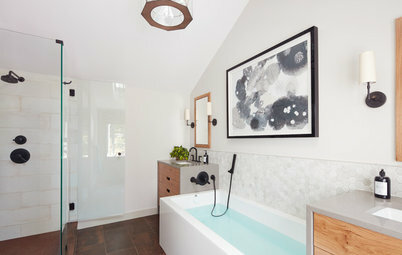 Scope: The family and Peña worked with AM Construction to tear down walls and add a skylight to make the bathroom feel open and bright. The bathroom project took about three months. 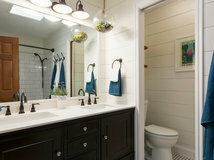 Before: The bathroom was divided into two rooms: one for the vanity and one for the toilet and shower. The division made the space feel cramped. 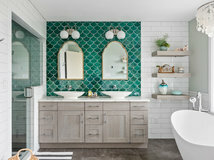 The mix of materials, including the different floor tiles in each room, created even more division between the two low-ceiling spaces. After: The dividing wall came down and the ceiling moved up to the roofline. 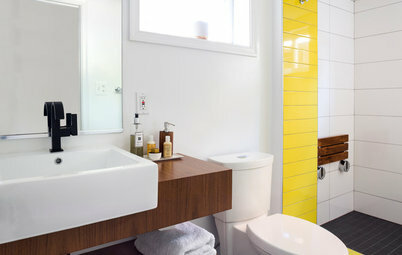 Both of these changes allowed Peña to create a bright, cohesive bathroom for the family. 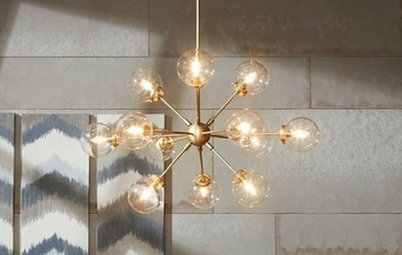 Lighting: At the top of their must-have list, the clients had better lighting. Peña first met that goal by adding skylights, which gave the room a lot of natural light. “The skylight was a game-changer,” Peña says. 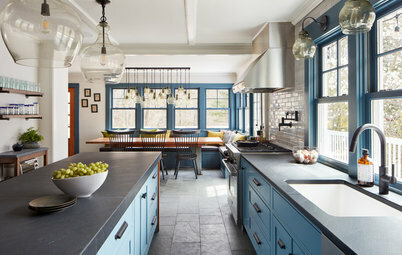 The windows along the wall added even more natural lighting to the space. They also decided not to add shades on the windows because the house sits high on a hill, so privacy is not a concern. 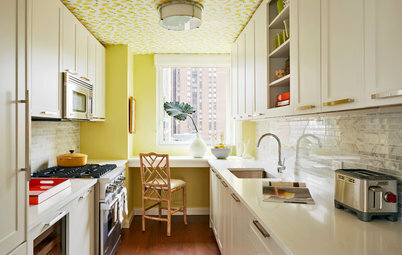 Flooring: One type of flooring — white hexagon tiles — covers the floor. They also used hexagons inside the shower to keep the room consistent. 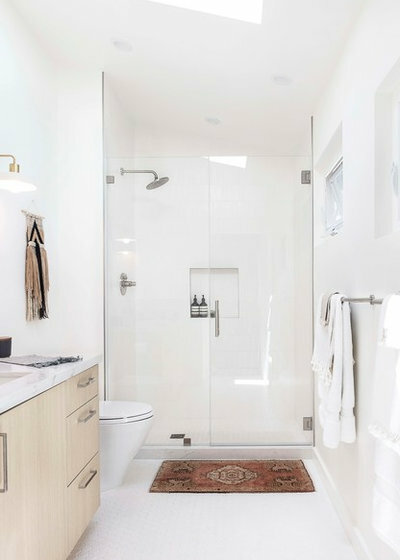 Rug: The bathroom rug and woven piece above the toilet add texture to an otherwise white and sleek bathroom. 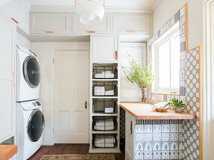 The vintage Persian rug doubles as a bathmat and matches the boho style found throughout the rest of the home to give the bathroom personality, Peña says. Pro tip: Don’t be afraid when adding in textural elements, Peña says. 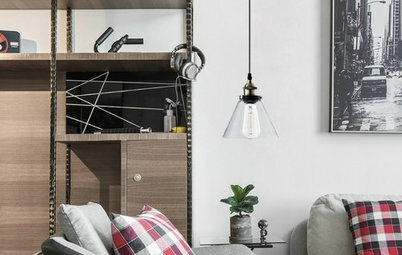 These pieces — rugs, towels and wall hangings — can easily be swapped out for a whole new look if you decide on a different style later. 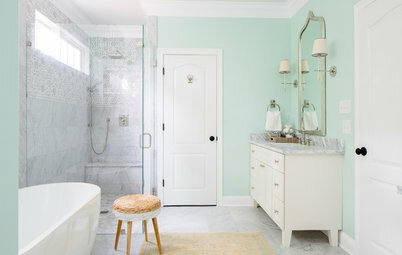 Shower: By removing the wall in the bathroom, the family could install a larger shower, which is now 6 feet wide and 3 feet deep. 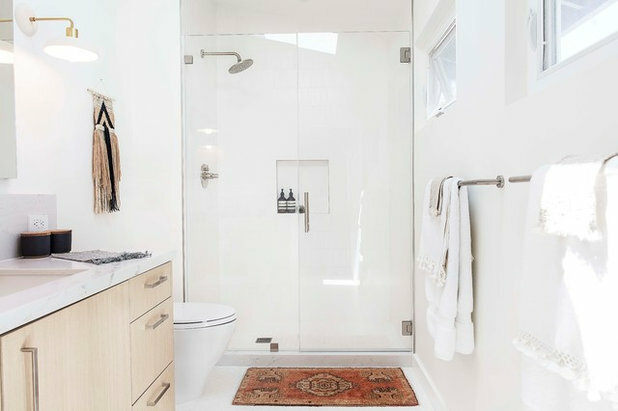 They also didn’t want any breaks in the bathroom’s flow, so they chose a glass shower door, which makes the shower space feel like a continuous element of the space. 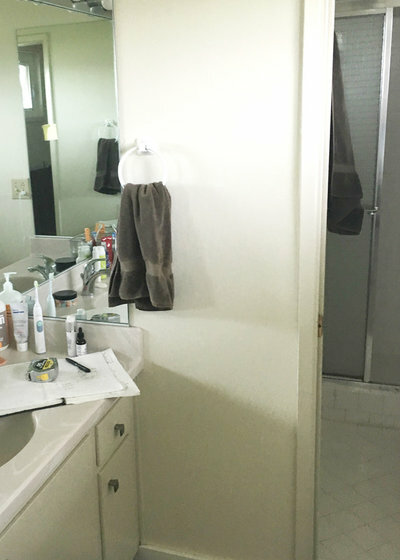 Before: The old vanity stood outside of the shower area and lacked adequate countertop space for the family. 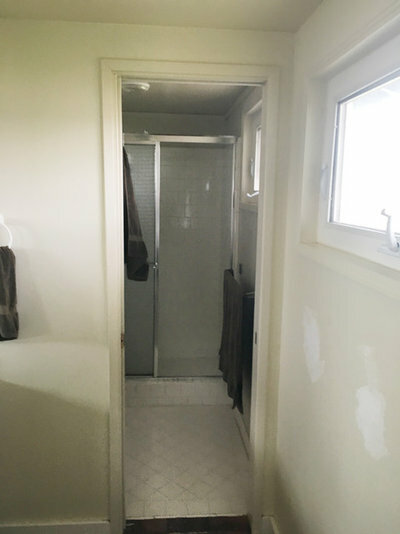 After: With the wall gone, the family had space not only for a larger shower, but also for a 5-foot-long vanity. 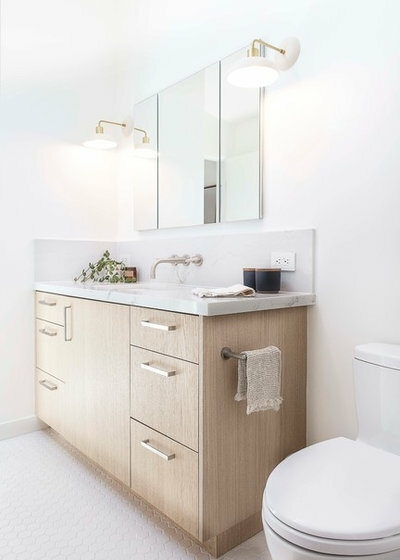 Storage: Peña had a custom oak vanity made to fit the space, which gave the clients the storage they wanted. 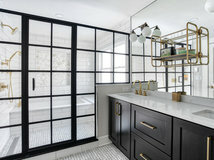 The mirrors also function as medicine cabinets, giving them even more storage. 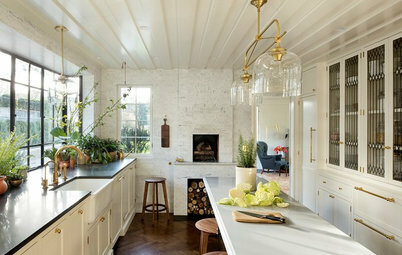 Faucet: The brass faucet comes out of the backsplash, an aesthetic touch that also saves counter space. When installing a faucet like this, make sure you plan the plumbing and design before new walls go up. Renovations continue: This project was short but made a huge impact on the peace and quiet of this couple’s personal space. 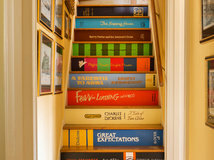 They have since decided to renovate other rooms in the house. 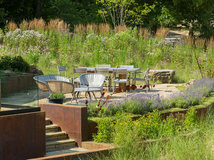 How do you keep in touch with your neighbors? 12"x12" Carrara White Elongated Hexagon Mosaic Polished, Chip Size: 1.25"x3"
12"x12.75" Carrara White Herringbone Mosaic Tile Polished, Chip Size: 1"x3"
Great transformation, but having gone so far I would had a suspended toilet and a bidet rather than such a large cabinet, which I would also have had suspended - gives a wonderful sense of 'floating' and makes it easier to clean the floor. Hello ybrough desperate from Southport! Painted surfaces are perfectly OK in a bathroom - we only tiled the shower cubicle. Can ironically be more expensive as the wall finish needs to be perfect - you can be less fussy if you're tiling. 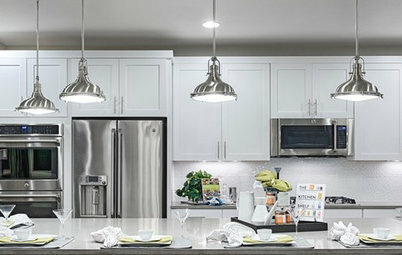 It won't look sterile with the carrara tiles, and you could add some bling with towel rails etc to flash the light around.